Today's Game of the Day is Zombie Training Simulator! Acceleroto inc. has created the world's first VR simulation that is built specifically to prepare players for a potential upcoming zombie apocalypse. Train and unlock powerful weapons including pistols, shotguns and machine guns. Learn the incredible zombie stopping power of each weapon. See how much zombies love fresh meat, sound and explosives. You'll need all these skills to conquer the incoming zombie hordes and each wave is more challenging than the last! 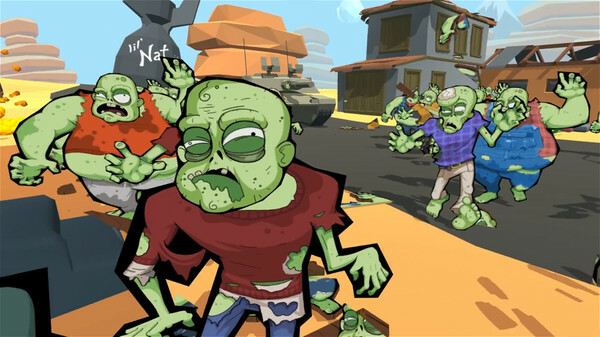 Zombie Training Simulator is perfect for adults and kids alike, and the cartoon-based art style looks beautiful when viewed in the HTC Vive headset. If you love taking down zombies but aren't a fan of the more scary titles, this is the game for you. When the zombie hordes arrive, will you be prepared?